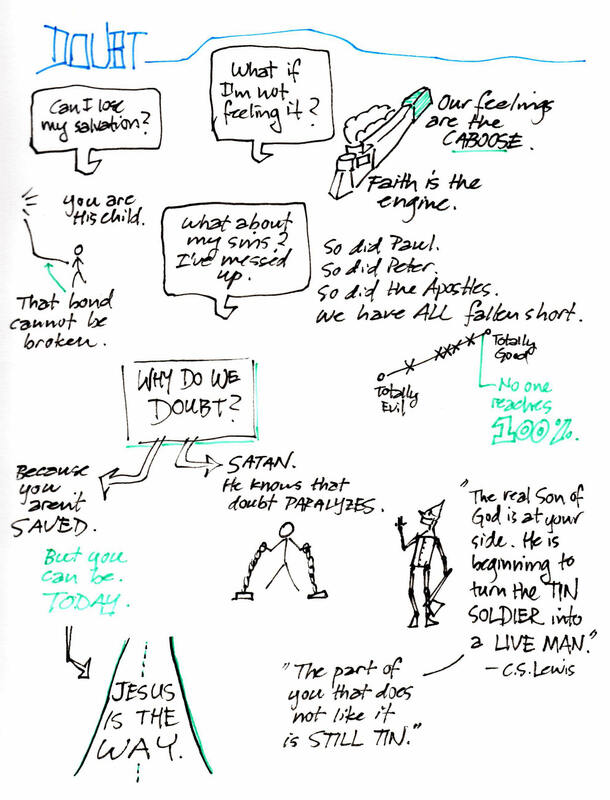 “Truth and doubt”, a doodle by Derek Bruff during a sermon by Brent Hutchinson. There is one element of my exploration of ordination that I have been slightly uncomfortable about from the start, if this was God’s will why had He seemingly not spoken through other people about it? It has felt like everyone else I have met, or heard about, that is exploring ordination has had people going up to them passing on messages from God. They might not know it but they have a gift of leadership, of preaching, healing, praying or something else that God wants them to be using. God has told them that they should be ordained. It is an experience I haven’t had, well not that I’ve noticed. And to be honest, which I generally am, I’m not sure how many people have even suggested that I should be ordained, a handful maybe. Sure I have had plenty of discussions and chats about ordination over many years, but from memory I cannot remember anyone declaring that their suggestion had actually come from God. Neither did it feel that the fact that the topic of ‘being a vicar’ was discussed was due to God. Such conversations felt rooted in the worldly realm and were conversations that every Christian had occasionally, so I thought at the time at least. Whether God was behind those conversations or not, there has been this element of doubt whether I am doing what God wants me to do. Doubt comes at its strongest when I am tired, have too many things to do in the time available. When I haven’t felt the supernatural power of God in my life for a while, when my faith has felt contained within my head, doubt rears its ugly head. When doubt does show up I remember those experiences of God that I, nor logic, can deny. They are the foundation blocks to my faith. I remember meeting Jesus on the train in the early hours of 14th December 1998. I remember God taking over when I and others were held at gunpoint by Milosevic’s army. I remember emerging from the spiritual desert last year with my faith awakening like plants in springtime. I remember the run when God gently spoke to me and suggested I at least look into ordination, to consider it entering a no-commitment, try before you buy, spiritual showroom. My interaction with God on ordination has felt like a private conversation. I’m not knocking it, hearing direct from God is an awesome and blessed thing. His gentle voice as I ran through my local community at the beginning of the year will stay with me forever. He has given me little titbits and blessings to let me know I am doing what He wants me to do, that I’m on the right track even if He isn’t going to tell me where it will end up. But when you only hear from God directly about something is it God or is it you speaking? Doubt, it’s one of satan’s greatest weapons. When God speaks to us through other people it is incredibly powerful. It can be confirmation that God is going to heal that pain you’ve kept hidden from everyone else. It can tell the body of Christ that God is at work in the situation, that God is in the house, in that person. It can silence the sceptics and dispel the doubters, and I have faced some of those. Hearing from God through others helps to know that we aren’t crazy thinking what we think, that we are discerning God’s will for our lives correctly. Having misinterpreted it in the past, to varying levels of embarrassment or disappointment, I need to be absolutely certain that I need to be ordained in order to actually go forward for it. Doubt could event stop me accepting a recommendation from a BAP. I can’t leave it so that the devil can use doubt to make me think I just gave the DDO, the Bishop, and others the answers they wanted to hear. You can probably therefore imagine my level of excitement when I had an email last week from someone saying that God had spoken about me to them. It wasn’t just anyone God had spoken through, it was my vicar and he knows a thing or two about God. It took me several attempts at reading the email before I got past my sheer delight about the fact that God had actually spoken about me, to someone else! Last week, whilst on a retreat, my vicar had been asking God what was on His heart and what He wanted on his. God spoke to him from 2 Timothy 2:2. God told him that He wanted him to find 5 people in whom he could invest spiritually, and that those 5 people should come from each of the 5 orders of ministry in Ephesians 4:11-13: apostle, prophet, evangelist, pastor and teacher. When he asked God who he should invest in each of the categories my name was given to him as a teacher and preacher. My vicar, who has known me as much disconnected from God as connected Him, added that he felt God was preparing me for teaching the scriptures. He’s not seen me preach, no one has, but he has no doubts. It’s pretty clear then. It confirms a lot of what I have felt God is wanting me to be doing. So there you go. Yes you doubt, off you go. The door is on the left. Bye bye. I’m sure doubt will pop in to say hi occasionally, it’s one of life’s guarantees. The destination of this particular journey I am on is getting clearer. Whether I need to be ordained or not is still a question, but not now a doubt. It is a feeling waiting to be explained because still I cannot tell you why I should. I’ll get there, I know that, but it can wait for a while longer to find out. Yes I know that last week (see Nobody expects the Spanish Inquisition) I said that the time to find out has come. I haven’t given up on it, I haven’t stopped wondering and I haven’t stopped asking questions. It’s simply a matter of not knowing where the answer will come from and that I have plenty to read and prepare before I next meet the DDO. So Michael Green’s ‘Baptism: it’s purpose, practice and power’ and Gerard Hughes’ ‘God of Surprises’, you’re next! Perhaps God will provide me with the explanation I’m looking for through one of those books. After this week, it wouldn’t surprise me. Glad to hear that you are hearing the sort of thing you need to hear, in an appropriate manner! Doubt can be a really crippling thing, just as confirmation (small ‘c’) can be so empowering.